Above and left: Comb Ridge, October 19, 2016. 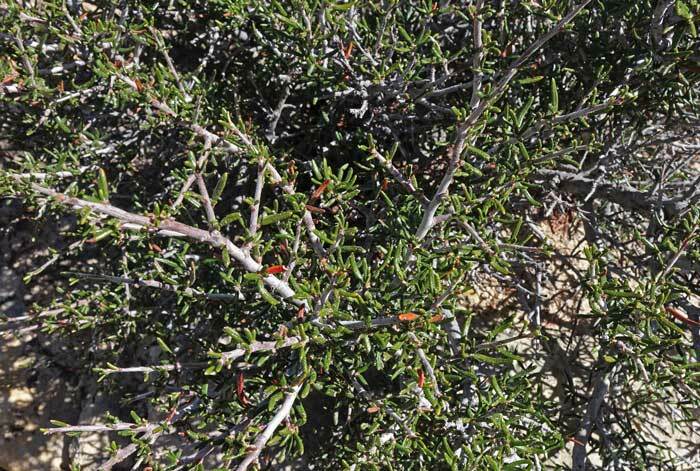 When Betty and I walked the wide open spaces of Comb Ridge (click to see)on a warm October day, we realized again how difficult it can be to distinguish between Coleogyne ramosissima and Cercocarpus intricatus, even if you get to within 7 feet of the plants -- as shown in the top two photographs. But when we got closer and made more careful observations (as shown immediately above and at left), we were soon able to distinguish between the two species, even from 20 or 30 feet away. One of the tricks in the late months of the year is to note the presence of orange-to-red leaves in Cercocarpus intricatus. As explained below, earlier in the year other characteristics can help distinguish between the two species. 1) Flowers and fruits are quite different, so when these are present the two species are easily distinguished from each other. 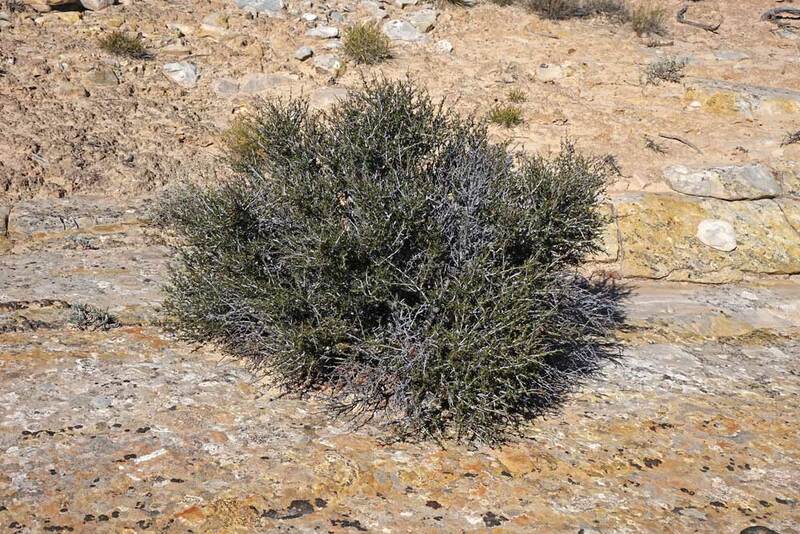 2) Looking out across wide shrublands (as in the first and second photograph below taken at Island in the Sky and Gateway), one can tell that the shrub is Coleogyne ramosissima, not Cercocarpus intricatus, for the latter never grows in such massive numbers. 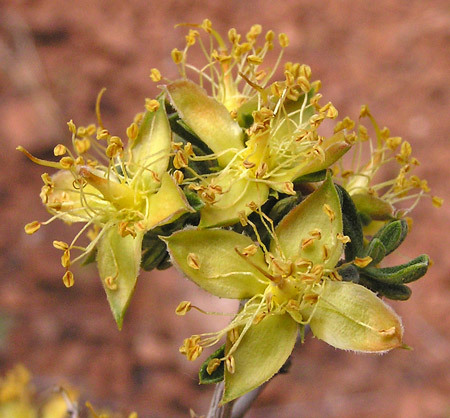 When the three conditions of flower, fruit, and massive numbers don't exist, as in the photographs above and to the left, the two species can indeed be difficult to tell apart. Following are a number of characteristics that separate the species. 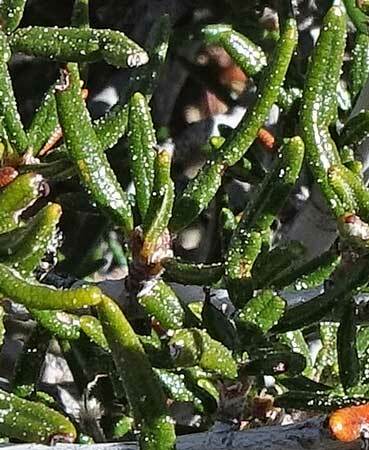 1) Coleogyne ramosissima leaves are, opposite; those of Cercocarpus intricatus are alternate. 2) Coleogyne ramosissima leaves are most commonly narrowly oblanceolate, i.e., they gradually widen from the bottom to the tip. Cercocarpus intricatus leaves are linear (or nearly so), generally a bit more narrow at the bottom and tip. 3) Coleogyne ramosissima leaves are most commonly strigose with malpighian hairs, i.e., they are attached, pick-head like, in their center to the leaf surface. The hairs are numerous enough that they give the leaves a gray tint. Cercocarpus intricatus leaves are most commonly hairy on the lower side with basifixed hairs, i.e., they are attached to the leaf surface at their bottom, just as our hairs are attached to our skin. Cercocarpus intricatus leaves are glabrous on the upper side and thus appear a bright green. 4) Coleogyne ramosissima leaves are most commonly flattened; Cercocarpus intricatus leaf edges are almost always tightly rolled under, giving the leaf a tubular appearance. (Click to see.) If you turn the leaf over you will usually see a thin line of white, the hairs of the lower leaf side showing through the rolled leaf edges. 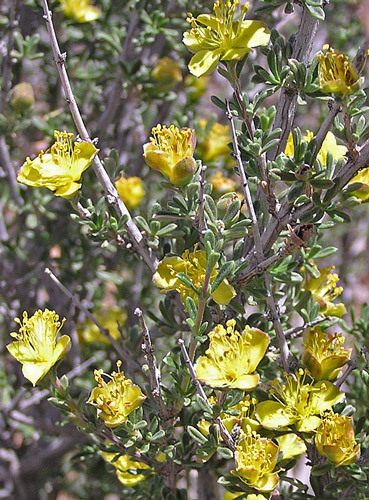 You may also notice that the upper leaf side is dotted with small glands. Smell the leaf for the odor of the gland secretions. 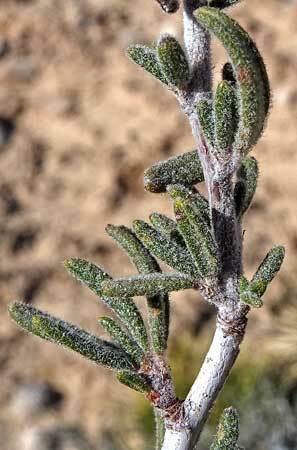 5) The very tip of the leaf of C. ramosissima is usually blunt, but may be finely drawn out almost to a sharpened point, i.e., the leaf may be "mucronate". 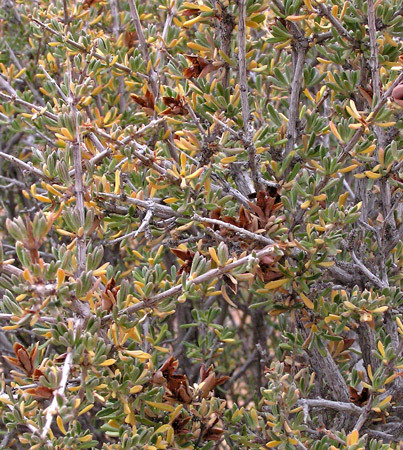 C. intricatus leaves are almost always mucronate when fresh but as the close-up photograph above shows, the mucronate tip may not be present after leaves age. Island in the Sky, Canyonlands National Park, Utah, March 23, 2001 and Gateway, Colorado, area, May 12, 2012. 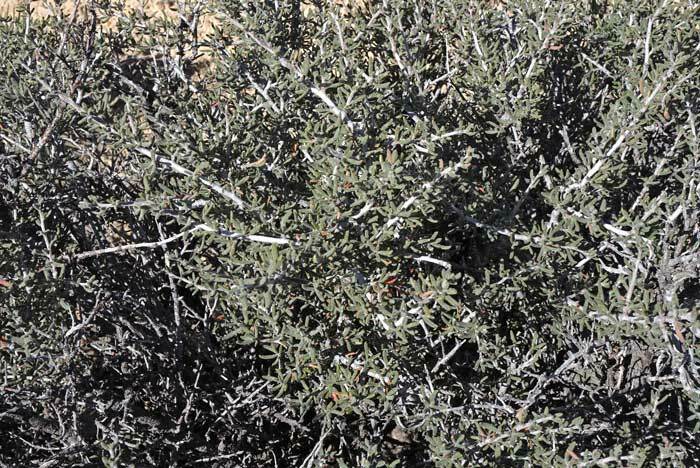 The gray-green appearance, low growth form, spiny branches, and tendency to dominate large tracts of the canyon country of Southeast Utah often make Blackbrush pretty easy to identify. 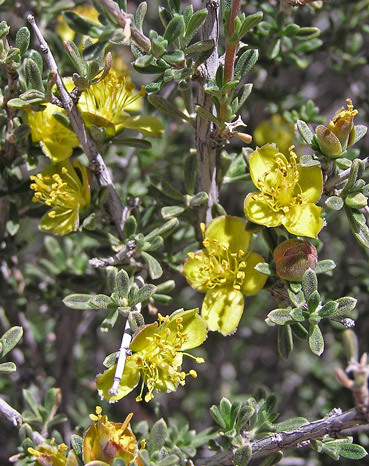 Its masses of yellow flowers (shown below) are attractive, but even though this plant is accustomed to drought, it is affected by prolonged drought years such as those of 1999-2004 in which it produced few flowers. 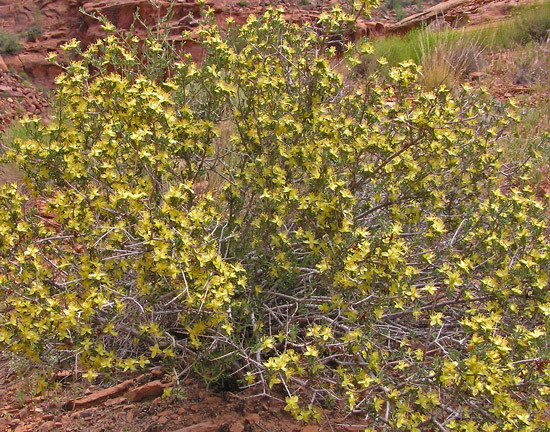 In 2005, though, the story was different: continuous winter and spring moisture produced masses of flowers on Coleogyne ramosissima and made Canyon Country golden. "Coleogyne" is Greek for "sheathed fruit", and "ramosissima" is Latin for "many branched". 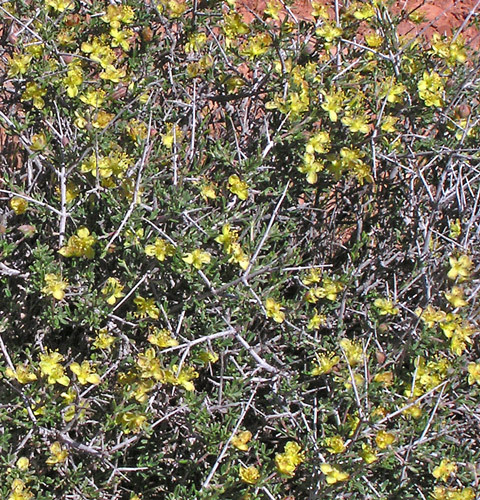 John Torrey named this genus and species in 1853 from a specimen collected by John Fremont in 1844. 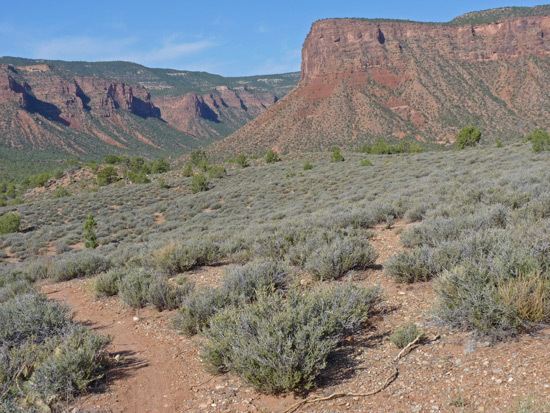 Hunter Canyon, Utah, May 3, 2005. Hidden Valley Trail, Utah, May 10, 2007. 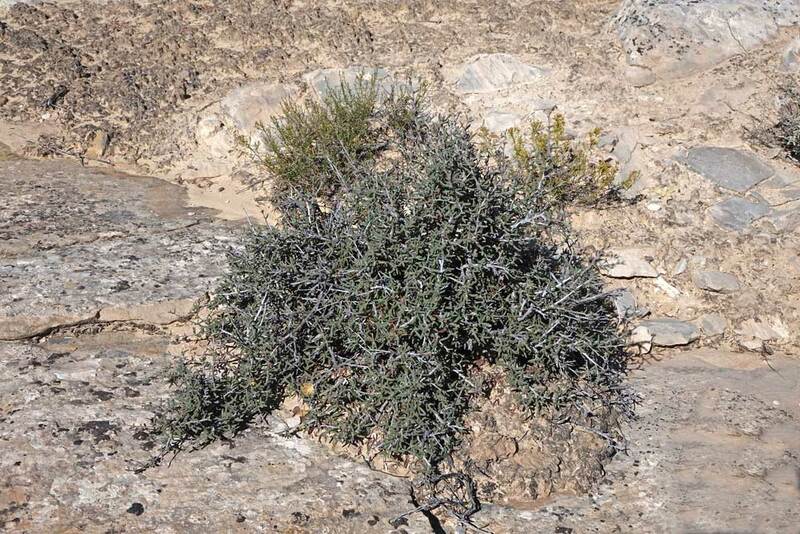 Coleogyne ramosissima has dense, intricately branching, sharp branches and is really more gray than black, yet the plant does appear dark because it contrasts with the light-colored sands it grows in. 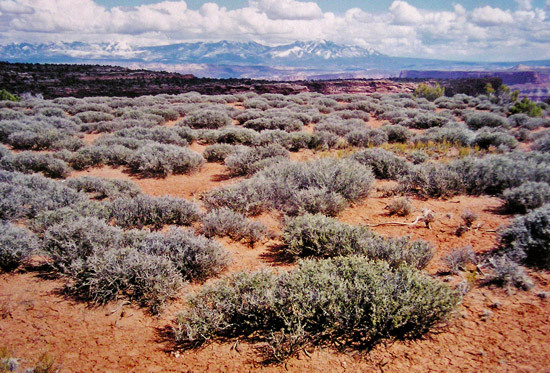 Confluence Trail, The Needles, Canyonlands National Park, Utah, May 20, 2004. Mesa Arch Trail, Island in the Sky, Canyonlands National Park, Utah, September 27, 2005. Mature seed pods and the pear-shaped seeds are tan to rich brown and remain on the shrub into the next season, making identification easier. Notice also the sharp points of dead branches.